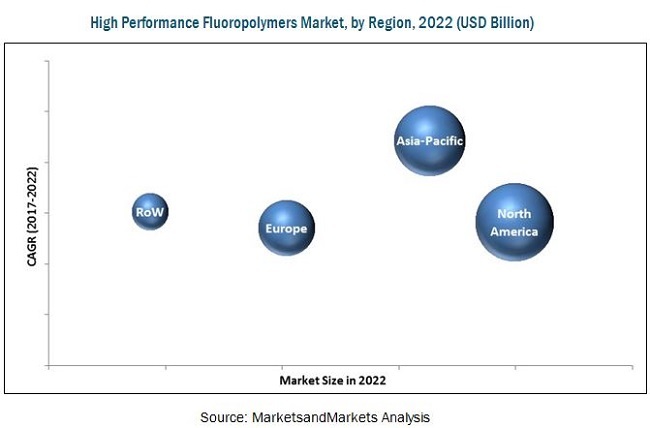 [126 Pages Report] High Performance Fluoropolymers Market was worth USD 3.49 Billion and is expected to reach USD 5.08 Billion by 2022, at a CAGR of 6.6% between 2017 and 2022. The base year considered for the study is 2016, while the forecast period is 2017–2022. The high performance fluoropolymers market is driven by the high demand from various end-use industries such as electrical & electronics, medical, industrial processing, and transportation, as well as improved regulations by the regional environment associations and optimized performance of HPFs. The report includes an analysis of the HPFs market by region, namely, North America, Europe, Asia Pacific, and Rest of the World. 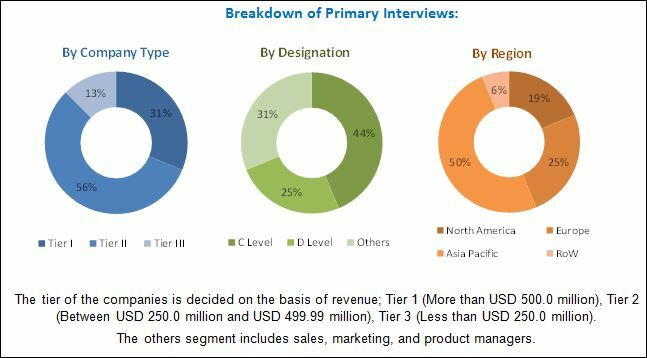 Both, top-down and bottom-up approaches have been used to estimate and validate the size of the global high performance fluoropolymers market and to estimate the size of various other dependent submarkets. The research study involved the use of extensive secondary sources, directories, and databases such as Hoovers, Bloomberg, Chemical Weekly, Factiva, Commonwealth Scientific and Industrial Research Organization (CSIRO), Securities And Exchange Commission (SEC), American National Standards Institute (ANSI), Organization for Economic Co-operation and Development (OECD), and other government and private websites to identify and collect information useful for a technical, market-oriented, and commercial study of the high performance fluoropolymers market. This research report categorizes the high performance fluoropolymers market on the basis of type, end-use industry, and region. The global high performance fluoropolymers market size is estimated to reach USD 5.08 Billion by 2022, at a CAGR of 6.6% between 2017 and 2022. The market has witnessed significant growth in recent years, and this growth is projected to persist in the coming years. Due to their properties such as high thermal stability, greater chemical resistance, high dielectric strength, low shrinkage, and greater design flexibility, HPFs are used for high-end applications in a wide range of end-use industries, such as industrial processing, transportation, medical, electrical & electronics, etc. Different types of HPFs are also included in the report. The main types are PTFE, FEP, PFA/MFA, ETFE, etc. The PTFE segment accounted for the largest market share in 2016 due to its superior properties such high chemical and thermal resistance, very low coefficient of friction, high electrical insulation, and usability for high temperature applications. It is also the second most used and expected to be the fastest-growing type of HPFs during the forecast period, due to its melt-processable property, which makes it useful to produce FEP tubing. High performance plastics are used in various end-use industries, such as industrial processing, transportation, medical, electronics, etc. These are the main end-use industries considered in the report. In 2016, the industrial processing segment accounted for the largest market share, in terms of both value as well as volume, followed by transportation, electrical & electronics, and medical. The large share of industrial processing segment is attributed to the increased usage of HPFs in chemical processing, food processing, pharmaceutical processing, oil & gas industry, water treatment, and other industries for equipment maintenance and processing. North America, Europe, Asia Pacific, and Rest of the World are the main regions considered for HPFs market in the report. North America is leading the HPFs market. The rising demand for HPFs in this region is mainly driven by their increased use in electrical & electronics and medical industries. Asia Pacific is the second-largest consumer and manufacturer of high performance fluoropolymers, globally. The region is also expected to register the highest CAGR between 2017 and 2022, in terms of both value and volume. This high growth is driven by China and India, which are among the fastest-growing economies in the world. In addition, the high growth is also attributed to the low-cost production of PTFE in China which is expected to encourage manufacturers to open production facilities in the country. The HPFs market in Europe is growing at a sluggish rate because of high import duties, resulting in the high prices for HPFs in the region. Though the HPFs market is growing at a significant rate, few factors, such as the high cost of HPFs than other conventional plastics, which increases the overall production cost, hinders the growth of the market, globally. Moreover, the price competitiveness from Chinese manufacturers is another challenge for the key market players. On the other hand, the increased use of HPFs in applications such as medical, electronics & electrical, industrial processing, transportation, and others, and the emerging demand for melt processable fluoropolymers is expected to propel the growth of the HPFs market in the near future. The top five companies in this market are The Chemours Company (US), Daikin Industries, Ltd. (Japan), Asahi Glass Co., Ltd. (Japan), The 3M Company (US), and Solvay SA (Belgium). Entering in related industries and targeting new markets will enable HPFs manufacturers to overcome the effects of volatile economy, leading to diversified business portfolio and increase in revenue. Other major manufacturers of high performance plastics are SABIC (Saudi Arabia), Gujarat Fluorochemicals Limited (India), The Dongyue Group (China), etc. 10.3 Asahi Glass Co., Ltd.
10.10 Shanghai 3F New Materials Company Ltd.
10.11.4 Jiangsu Meilan Chemical Co. Ltd.